Custom Inflatable Tents - Get Your Inflatable Dome Canopy! We focused our research and development on creating a unique, attractive inflatable dome tent unlike any other. The result was a modern, sporty product that surpassed our expectations. Designed to give your brand the right exposure, the Air Dome custom inflatable tent will surely leave a lasting impression at any event. We have efficiently designed this fast inflating valve system which creates unidirectional air flow. It guarantees that no air will escape when you unplug your air pump. Reinforced anchoring system for securing your inflatable event dome tents on different terrains. Located on all four legs, these provide maximum security. The valve system will automatically release excess air when the optimum pressure is reached. Operating pressure is 3psi (200 mbar). To give you freedom to customize your Air Dome inflatable canopy, we have added heavy duty zippers that allow walls and windows to be added. High quality fabric ideal for outdoor use. Its upgraded PU coating protects against the wind, water and UV rays. It is also fire retardant for your safety. Our selection of Dacron® fabric differentiates this product from the competition. Offering solid durability and resistance in variable conditions, Dacron® performs well against abrasions and dry conditions. Its fiber has low absorbency which allows it to dry quickly. EXTRA-STRONG 8 LAYER SEAMS to guarantee the correct air pressure resistance. Our advanced AIT (Airtight Inner Tube) technology does not require continuous air supply to keep the correct amount of pressure within its structure. 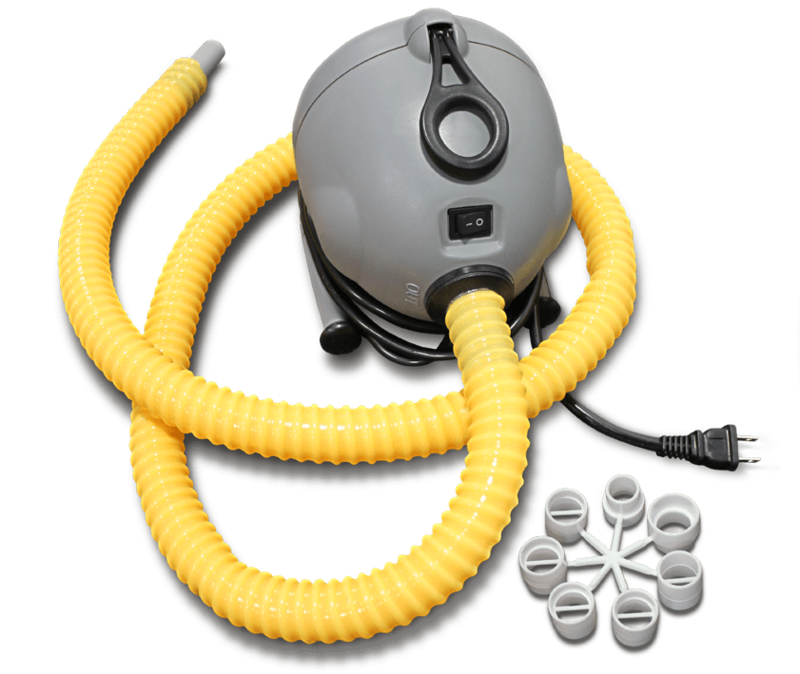 The AIT technology eliminates the need for constant air flow! Once the frame is pumped up, the air is sealed off inside and won’t be released until you open the valves. We offer a variety of different printing methods available for your ideal custom inflatable tent. Our focus is to deliver high resolution printed items that will highlight your brand. The fastest solution for inflating your AirDome. Charges about three tents with one cycle. Rechargeable with AC and 12V. Ballast weights – the perfect solution to anchor your tent on asphalt. Output: 1700 l/min Max pressure: 250 mbar Power: 1000 W. Included with every AirDome purchase.